VeggieTales Live! 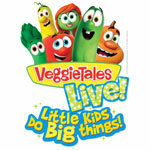 Little Kids Do Big Things is a must-see, fun filled celebration for families and VeggieTales fans of all ages. Join the VeggieTales crew in a musical review that celebrates that with help and faith, even little kids can do big things too! This all new production features live performances of Veggie silly song favorites like The Hairbrush Song and I Love My Lips as well as songs that inspire like Big Things Too. Children will be thrilled to see their favorite Veggie friends live on stage performing in a rollicking musical review of VeggieTales greatest hits. This high-energy show is sure to delight children and families of all ages. VeggieTales is the best-selling brand that delivers stories and songs kids love and values parents appreciate. It is the go to brand for families for wholesome quality entertainment that promotes values and lessons kids use for a lifetime such as telling the truth, sharing and forgiveness. For the most up to date tour itinerary and additional ticket and tour information please visit www.veggietales.com/live. © 2015 Big Idea Entertainment, LLC. All Rights Reserved.